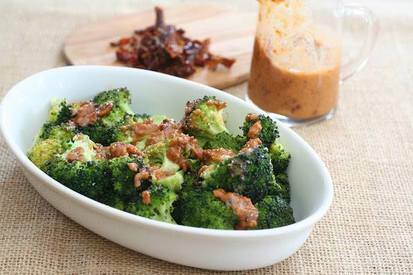 Broccoli w/ bacon & sun dried tomato vinaigrette! Roasting broccoli is a great way to keep all the great flavor without the overcooked cabbage-y taste and smell. Simply toss it with a little oil, some salt and pepper and it makes a great side dish. I paired the roasted broccoli with a delicious chunky vinaigrette full of Bacon and sun dried tomatoes and it is now my favorite way to eat broccoli! The dressing would be great on salad as well. Why? Because Bacon makes everything taste better!